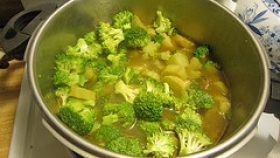 Have you made Broccoli Soup (With Tomatoes)? 1. Wash the broccoli thoroughly. 2. Slice it in small pieces, discarding the tough part of the stalks. 3. Chop well the garlic, parsley and bacon. Pour the olive oil into a soup pot, add the broccoli, garlic, parsley and bacon, and saute them for a minute or two while stirring at the same time. 4. Add the tomato paste and 2 cups water. Stir well. 5. Cover the pot and allow the soup to cook for about 5 minutes. 6. 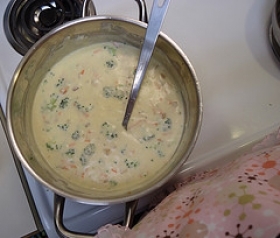 Add the remaining water and cook the soup over medium heat for about 30 minutes. 7. Add salt and pepper and simmer for a few minutes. 8. 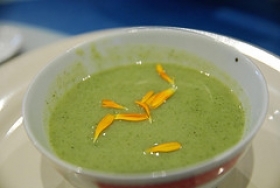 Just before serving, puree the soup in a blender. 9. 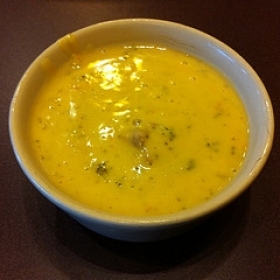 Soup can be served hot or cold. 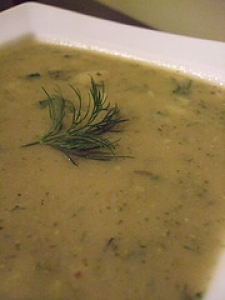 If it is served hot, garnish the soup at the last minute with some grated cheese. 10. 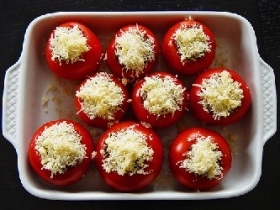 When served cold, it should be refrigerated for at least 2 hours, and instead of the grated cheese, one may add 1 teaspoon sour cream to each serving bowl as a garnish. This recipe is high in Vitamin A with 23% of your daily recommended intake per serving. This recipe is high in Vitamin C with 90% of your daily recommended intake per serving. 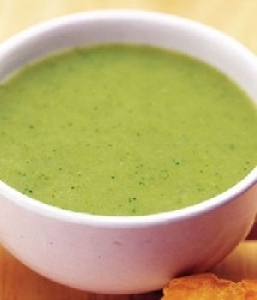 This recipe is a good source of Vitamin E with 18% of your daily recommended intake per serving. 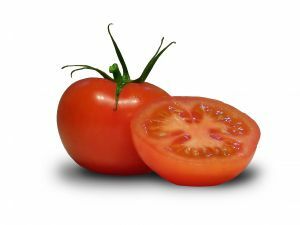 This recipe contains potential food allergens and will effect people with Tomato, Garlic, Beef, Olive Oil allergies.